Recently a North Fort Myers woman was arrested and charged with drunk driving after authorities say she nearly caused a secondary accident after she drove through the marked crime scene of a serious injury crash. Our personal injury attorneys have spent more than 40 years representing those injured or killed in collisions with drunk drivers. We know too well the pain and suffering caused by motorists who get behind the wheel after having too much to drink. It is a leading cause of traffic collisions nationwide– typically blamed for about one-third of fatal crashes each year. In 2016, Florida reported 3,174 road deaths, with 1,342 of those deaths involving a drunk driver. In this case, the 41-year-old driver was found to be in possession of marijuana and had a blood-alcohol limit of .154, nearly twice the nationwide legal limit of .08. Alcohol increases the risk of accidents because it dulls the senses and slows reaction time. While that may seem obvious, what is less obvious is what such accidents can teach sober drivers. Drunk driving and distracted driving are often enough to cause a collision in their own right. But in many cases, these driving behaviors cause a collision because they amplify other poor driving decisions behind the wheel — or because a driver encounters unusual driving or road conditions. Like the sailor’s old adage says: Anyone can hold the helm when the seas are calm. Traffic accidents, backed up traffic at intersections, road detours and construction, confusion caused at intersections, poor weather or visibility, reaction to actions made by other unsafe drivers, poor driving or pedestrian behaviors in parking lots, outside distractions, or a vehicle breakdown. These are all factors that increase our risk for a traffic collisions. It’s just that they are even more of a risk if a driver is distracted or intoxicated. In many cases, an accident has already occurred — whether a minor rear-end collision at an intersection or a major freeway collision — and a secondary accident occurs either because of backed up traffic, confusing detours or outside distraction. From a legal standpoint, these can be complicated cases. Sometimes, an insurance company may try to pin the blame on the at-fault driver who caused the initial collision, arguing if not for that collision there would have been no secondary collision. These cases also typically involve multiple insurance carriers and multiple claims from more than one victim. Seeking out the experience of a personal injury law firm as soon as possible will allow you to make a timely claim, which may be of additional importance in cases where lim ited insurance is available to cover serious injuries to multiple parties. From the standpoint of staying safe on Southwest Florida roads this season, there is no better place to start than giving yourself a little extra time to reach your destination. Don’t follow too closely. Don’t speed. Don’t drive aggressively at intersections. Yield to motorcycle, bicycles and pedestrians. And yield to emergency vehicles. Flashing emergency lights should be your cue to move over, and stop or proceed with extra caution. Florida law, F.S. 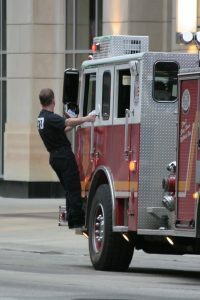 316.126 requires motorists to pull to a stop at the curb and clear intersections for approaching emergency vehicles. The Move Over law requires drivers on the interstate to reduce speed and move to the lane furthest from emergency workers.